When the community called, the Department of Computer Science (CS) answered! 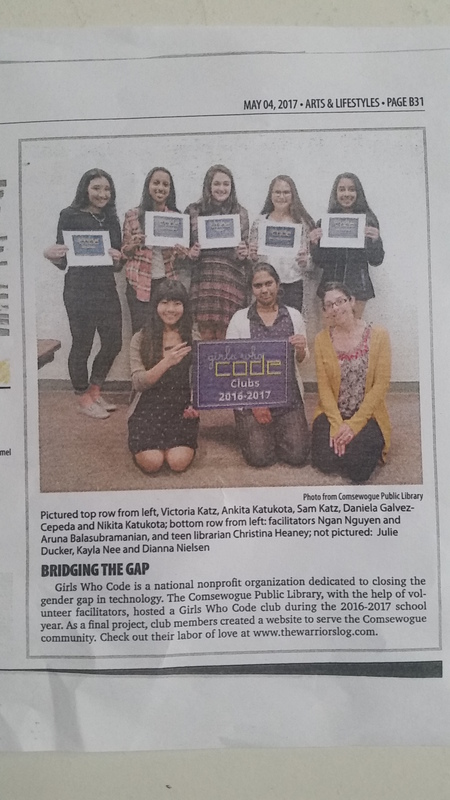 Teen librarian Christina Heaney from Comsewogue Public Library initially contacted Stony Brook's Department of Computer Science a year ago in the hope of gaining some mentors in her quest to establish a chapter of Girls Who Code. CS faculty member and local resident Aruna Balasubramanian immediately responded to her request and the library was granted chapter status by Girls Who Code. Working with SBU students, including Ngan Nguyen, Balasubramanian volunteered as a facilitator for the group during the 2016-2017 year. By the end of the year, club members had created a website (thewarriorslog.com) for the Comsewogue community. Girls Who Code consists of 40,000 girls in 50 states who strive to create technology that empowers their communities while closing the gender gap in technology. Assistant professor Aruna Balasubramanian joined the CS department in 2015 and spearheads the women PhD student group, Wphd. She earned a PhD in computer science from the University of Amherst.